“Winter collapsed on us that year. It knelt, exhausted, and stayed.” Emily Fridlund, History of Wolves. The final day of February and the cold is unrelenting. 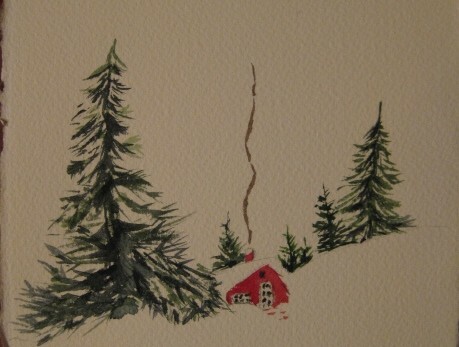 In the deep dark of night, the house wakes us up with the cracking and groaning sound of winter, as the timbers contract and twist, or whatever they do to make that noise. The snow falls straight down out my window this morning, making ever deeper piles of snow, which are closing in around the house. It feels like we could all collapse under its weight. The poor deer. Every evening at twilight, they trudge down to the water in blue light, and dig under the deep snow for leaves and branches. I’ll look out the window to see a bush violently swinging back and forth, as a deer digs deep into the ground, searching for roots. It makes them look desperately hungry, which surely they are, as snow covers their backs in the bitter cold. Don said that he’s seen one, several times, with a damaged back leg, most likely broken. But, he’s eating, and maybe he’ll survive until spring, but would never be able to flee from a predator. Oh, I hope I don’t see him. I wonder if somewhere in their DNA, they actually carry hope for Spring. Does that keep their life force alive, perhaps the memory of bedding down in grass warmed by the sun, the scent of blossoms in the air, and songbirds in a tree overhead? Or, is it simply that they know how to wait, as Philip Booth writes in his poem, How to See Deer, “You’ve learned by now to wait without waiting”. new shapes in your eye. On Monday, during the coldest Arctic air mass yet this winter, Don drives to Calgary to catch a flight to Norway, for two weeks of ski racing. I’ll leave soon after, flying off to Arizona to visit a friend, then on to Berkeley for a week with the grandkids. Just getting out of here is a challenge–is our road passable, are the flights taking off, are the two-lane highways all the way to Canada open? Raccoon tracks have been spotted up at the garage again, so the bowls of food and water we leave for the kitties, who stay warm inside on their heating pads, are likely to be decimated by the pesky raccoon who squeezes in through the cat door. We can’t ask any friends to risk their life or limb by driving down our road to refill the bowls–maybe our snow plow man will be game? This entry was posted in Uncategorized on February 28, 2019 by rebsuebauder. Yesterday was the clearest, sharpest, bluest sky of all the winter days. Everybody was talking about it, even as most of us our discouraged by the never-ending pattern of subzero mornings and regular snowfall. It felt as if February was giving us a gift, so we could just hang on until March, when there will be genuine signs of hope. There is something about the quality of light, as the sun creeps up off the horizon, that gives the snow drifts and fields such beautiful and interesting colors this time of year. When I’ve been driving into town in the morning light, the top of the vast fields are that lovely shade of pale baby blue, but, wherever there are snow drifts, the vertical plane of the snow looks like bright white satin. It’s not shimmering with diamonds dancing in the snow, but it looks silky, and folds like fondant icing over the blue fields. Last night’s sunset spilled rose gold across the land, and shadows became Bleu de France, that distinctive happy blue found in striped cotton T-shirts, worn with a pair of white capris and red-painted toenails. And, then, there were the winter stars. We had been to dinner with friends, in their cozy house in the woods, and when we came down our dark road, we could see that the stars were shining to the horizon line. The supermoon had not yet risen in the east, and I walked up our road, away from the lights of the garage, to take in the sky. So many constellations I cannot name, and the broad swath of Milky Way, were in a blue-black sky, that was the same color found in charming vintage Christmas cards, in which golden light spills on snow from a little cabin, and white smoke curls from the chimney into a dark night, with snow flakes dotting the trees. It was that kind of night, as the heavy flocking of snow covering our tall pines, actually glowed by the light of the stars. I’ve been looking at photos and videos this morning of Scottsdale, Arizona’s big snow fall last night. How awful would that be, for everyone who thought they were safe from winter’s wrath. It’s clouding up here, with more snow to arrive by night fall, and subzero temperatures at the end of the week-end. March 4th is still the first day predicted to be above freezing. That’s something to look forward to, and, yesterday, was something to remember. This entry was posted in Uncategorized on February 22, 2019 by rebsuebauder. “It seems like a broken record with continued chances for snow. Expect day-time highs to be 10 to 15 degrees below normal.” NOAA forecast for today. After a week-end of snow, we did have splendid sunshine yesterday, on a day that started out at -11 degrees. We even had a view of the supermoon as it was setting on the other side of the lake. There was blinding bright light beaming into the house at cocktail hour, and the outdoor Christmas trees looked ridiculous when the timer turned on the white fairy lights. The kitties have turned into baby bear cubs, with their winter weight, as they spend their days on the porch, staring into snow. If you are trying to stay committed to winter, you couldn’t have had a better houseguest than we did this week-end–John Miller. He’s the only person I know who says that winter is his favorite season, by a landslide. Having him and his family here with us helped keep me in season for, at least, the long week-end. While they went skiing, I went snowshoeing in the woods–for the first time this year–and wondered why I haven’t done this sooner. The snow was knee-deep as I trudged along deer tracks, and it was exhilarating to be in such silence, with only the sound of eagles overhead. Truly, tears-in-your-eyes beautiful. It’s lightly snowing in this morning’s sky, with blue light coming on so much earlier, now that we’re past the mid-point of this short month. The forecasters have said there could be a lake-effect intense band of snow hitting the east shore this afternoon, which would give me an excuse to cease all household chores, and lie on the sofa with my book, to watch it fall out the windows. I confess, I did take a peek at the long-range forecast this morning, and discovered that the first day predicted to be above 32 degrees is not until March 3rd. Lovely photographs of snowdrops and daffodils are popping up on many of the blogs I follow. But, sigh, winter lingers on, a broken record, here in the north country, so it’s best to just stay the course, enjoy the view, and don’t worry. This entry was posted in Uncategorized on February 19, 2019 by rebsuebauder. We survived the Idaho passes to and from Spokane, and made it safely home. Arriving back to the lake, from the west shore, it looked like it was covered in ice all the way across, and a little village of ice fishermen had made camp out in Somers Bay. But, on our side, it was open water as usual, and another six to eight inches of new snow had fallen at the house. The plow has been generally keeping up, which is a good thing, with more snow forecasted the rest of this week, and the next. I put on my tall Sorel boots, grabbed a ski pole, and made a path down to the water. The snow was deep enough to come over the top of knee-high boots, and the kitties were not the least bit interested to follow me in my path. There were deer tracks out to the end of the dock, and I thought how they probably do what I do–walk out and survey the lake from north to south, trying to remember warm summer days. Alas. Winter it still is, so best get on with it. I did a little painting up in the dormitory room where I keep my easel. I listened to music, and watched out the dormer window as a flock of coots bobbed in the water, and I could see waves creating ice at the shoreline. There is no slow time like this in the high-energy days of summer, when the rooms upstairs are filled with kids, screen doors are banging, and light remains in the pink sky until 11 p.m. So, best get on with winter’s quiet and lumbering pace, the books to be read, and the long nights of sleep. This entry was posted in Uncategorized on February 13, 2019 by rebsuebauder. We drove home from Sun Valley yesterday in serious Winter. Wet and heavy snow in Idaho transitioned to ice, in Montana’s Bitterroot Valley, as we ran into the arctic front boundary, and we watched the outside temperature plummet over a few short miles. On our final stretch before home, NOAA issued a blizzard warning, and there was news that flights could not get into the Kalispell airport because of limited visibility. At last, we made it home before dark, down our snowy road, mercifully not too deep. Kitties had hung out on their heating pad in the garage, their food undisturbed by raccoons, and after shoveling the stone steps, we unloaded the car and went into the house, power intact, and furnace pumping out hot air. That’s called a grand homecoming. This is a glass half-full versus glass half-empty sort of month. As I write this morning, the snow is getting heavier and I can hear the house creaking in the cold, and little Chatpeau is wailing on the porch to come inside, remembering the bliss she felt on my lap next to the fire last night. I’m too cold and creaky to shovel the steps this morning and make it to yoga class, promising myself, instead, to do a home practice in the library, where the soft warm carpet covers the floor, which is just above the basement mechanical room, making it feel like we have radiant floor heat. This feels like a glass half-full decision. I think the trick in these February winter days is to follow Ben’s advice, and step outside at 4:30 in the afternoon and say aloud to oneself, ‘my god, it’s still daylight, how amazing’– the dark days of December seem already distant. And, be alert to the “sense of what’s next – and of a beginning, not an ending.” I’ll be working on this. This entry was posted in Uncategorized on February 4, 2019 by rebsuebauder. Boy did it snow–way more than a “dust”. There was another snowbound day, with ten inches of snow on the road, and we had to wait our turn for the snowplow man to come. At last, I made my way out of here for yoga class, and Robin said to me, “You must be really happy about the snow”, reminding me that I said I’d be happier about winter if it would just snow. In truth, I was beginning to feel like Bill Watterson, of Calvin and Hobbes fame, “I like these cold, gray winter days. Days like these let you savor a bad mood.” But, then, around 4:45 in the afternoon, with amazingly light still in the sky, I went for a walk until dark. Oh, such a “change of mood” to be out in the blue-lavender light of dusk, with geese formations flying overhead against brooding clouds. There was not a breath of wind and the heavy snow did not move from the tree branches. I felt like I could stay out there in such stillness forever, until the cold and darkness finally called me home. This is what winter can be like, sometimes, in our best moments, when the mystery of transcendence brushes against us. It’s one of those feelings you come back to at 3:00 in the morning, when you awaken in the dark, with your heart racing from some trouble, deep in your subconscious. As slow as January has gone by, now, it feels like it’s picking up speed, and I realize that I am losing time in this pause month. I’ve abandoned my clearing-out projects, choosing instead to watch YouTube videos of Marie Kondo joyfully fold a shirt or contour sheet. I did finish yet another book, and I’ve sketched out a potential watercolor painting of the lighthouse I photographed at Cape Cod National Seashore last Fall. It was late in October, and we were walking along the shore in the same kind of blue twilight of my snow walk the other day. The clouds were as dramatic and gray and fierce as I’ve ever seen, and the wind was howling, and the sea mist chilled my face. Every time I look at that photo of the lighthouse, high on a bluff, with raging clouds swirling around it in waning light, I remember exactly how I felt in that moment. It seems worth the effort to see if watercolor can capture what it was all about, or, maybe, it’s just enough to write about it, sealing it into my memory, available to me in the middle of a dark night. This entry was posted in Uncategorized on January 26, 2019 by rebsuebauder.